What do you do when your team has the ball? When your team has the ball near your goal you should first safe guard your goal. If there is any risk that the other team could score, you should use a clearing kick to move the ball out of the back zone and into the middle zone. If you have the ball in control, pass the ball up the field. When your team has the ball in the middle zone you should maintain possession of the ball and move it into the forward zone. In the forward zone you should shoot at every opportunity. What do you do when their team has the ball? When their team has the ball near your goal you need to stop them from taking shots. Use a clearing kick to move the ball out of the back zone and into the middle zone. You may even need to kick the ball out of bounds to prevent a shot on goal. When their team has the ball in the middle zone you should try to slow down their forward progress as you look for an opportunity to steal the ball. In the forward zone you should attack the ball as quickly as you can. Do not hesitate, do not give them time to think, force them to pass the ball to another player or steal the ball from them. Keep the pressure on. 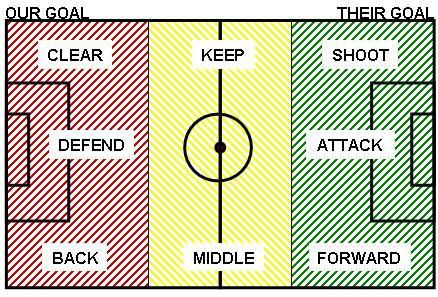 Where do you send the ball? When the ball is near your goal, the ball needs to be moved to the side of the field, away from the goal. 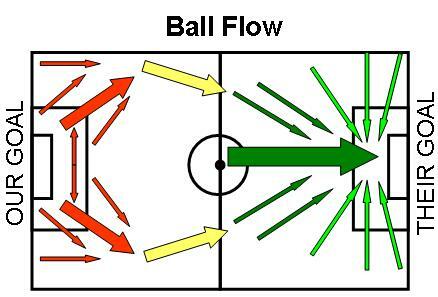 When the ball is in the center of the field, the ball needs to be moved into the forward zone to create scoring opportunities. When the ball is in the forward zone, it needs to be passed in front of the goal to a player positioned to shoot on the goal.